The Save Manston Airport group continues as Supporters of Manston Airport. This name change was voted in by our members to reflect our continuing role after the airport re-opening and under advice in order to apply for charity status and funding. The Supporters of Manston Airport committee is becoming more streamlined, proactive and professional. After a majority vote of no confidence in chairman Keith Churcher, due to an unfortunate and continued break down in communication, we have sadly had to part ways. Dan Light felt that he could no longer continue with the Supporters of Manston Airport after this reorganisation and so has chosen to move on. Dot Favell, after careful consideration, has also decided to step down from the committee for health and family reasons. We wish them well in their future ventures and thank them for the time they have given the cause. We are actively seeking a spokesperson for the group but until then this will be managed in-house. We are also interested in recruiting other committee members, please get in touch if you’re interested. We’d also like to recognise our members who play a valuable role in support of the committee and this campaign. We continue to make the fight for Manston Airport our sole and primary purpose. We have meetings with several parties scheduled in the upcoming weeks, details and reports back will follow. We are determined to become a more organised and professional group, and with this we welcome our first newsletter. A compulsory purchase order PIN (prior information notice) has now been issued by Thanet District Council. This will allow the next stage of the CPO process to occur. The next stage, a contract notice in the Official Journal of the European Union, will occur after 52 days have elapsed – as required by law. More information on the CPO process and timescale can be found here. More details are expected to be published by Thanet District Council in the coming week. Make sure to check the Thanet District Council website and our campaign for updates. An SMA event to raise awareness and funds of the continued campaign. Join us on Saturday 6th September from 14:00 until 18:00 at Manston Court Holiday Park, Manston Court Road. With music from Paul Messenger, Beggars Belief, Brad Pittance and the Pirates, Nylon Tigers, and Jennifer Maidman & Friends, it’s sure to be an excellent afternoon for the whole family. Food and drink will be available for purchase as well as a bar. There’s also plenty of activities for children to enjoy, even a bouncy castle! Tickets are £6 in advance or £7 on the day, or a family ticket for £15 in advance or £18 on the day. 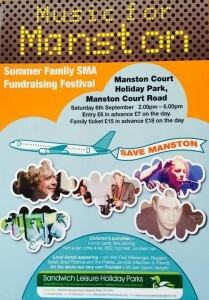 Advanced tickets are available from contact@supportmanstonairport.org. Special Edition Festival Tees £10 available from Jo Sharp on 07875 056253. Thanks to Andy Girdler and Sandwich Leisure Holiday Parks for hosting and thanks to all the musicians involved for giving up their time. Thanks to Kerwyn Watson and John Bywater Transport for the ‘stage’ and all others involved. Have you seen the open letter by Gary Easton published on our website this week? A very informative and interesting read on the operations and successes of Air Atlanta and EUJet from Manston Airport. An exclusive interview with Ann Gloag was published in the Isle of Thanet Gazette this week. We’re now preparing our response, and welcome submissions. We hope to have it published in the Gazette next week. We thank forum user ‘Finn McCool’ for creating some great ‘Manston Myths’ posters to help spread the facts and dismiss the common myths that the airport faces. We’d love to see some of these put up out and about in prominent areas. The full set of posters can be viewed here. The minutes from the last committee meeting are now available to view here. Topics included our new website and social media outlets, organisation of the group and committee roles, and future activities and events to support the campaign. We thank you all for your continued help and support in the campaign to save Manston Airport. We look forward to continuing working with you all to reach the outcome this community needs and deserves.